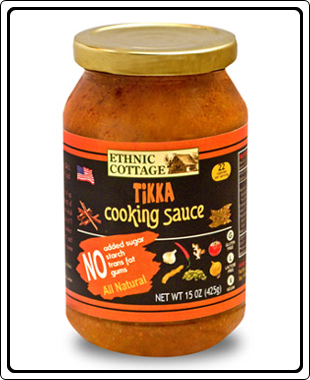 Ethnic Cottage’s Tikka Cooking Sauce is a Rich, Aromatic, Spicy, Tomato based Curry. GMO and Preservative Free. Ingredients : Tomato Puree (Tomato paste, water), Diced Tomatoes in juice, Onions, Lemon Juice from Concentrate, Expeller pressed Canola Oil, Fresh Ginger, Fresh Garlic, Coriander seeds, Cumin seeds, Sea salt, Paprika, Turmeric, Red pepper, Cinnamon, Cloves, *cardamom and bay leaves. Cooking Directions : Marinade 2.5 - 3 pounds of cut up boneless chicken (1 - 2 inch cubes) with the content of the jar. Chill for about 30 - 40 minutes. Heat a non stick frying pan and stir fry chicken vigorously for about 5 minutes. Add the leftover liquid with about 4 oz water and Cooking until chicken is thoroughly cooked and sauce is nice and thick. Serve with Naan or over warm Basmati Rice. Serves about 12.